This entry was posted on 12 December 07 at 11:10 and is filed under China, Expat Life, Food, Linyi, Wordless Wednesday. You can follow any responses to this entry through the RSS 2.0 feed. Both comments and pings are currently closed. Neat. I’ve never had a baked sweet potato but I’d try one of these. They are supposed to be very good for you. Happy WW! I love baked sweet potatoes! Mmmmmmm! Nice photo…making me hungry. Baked sweet potato is yummy! Beautiful picture. 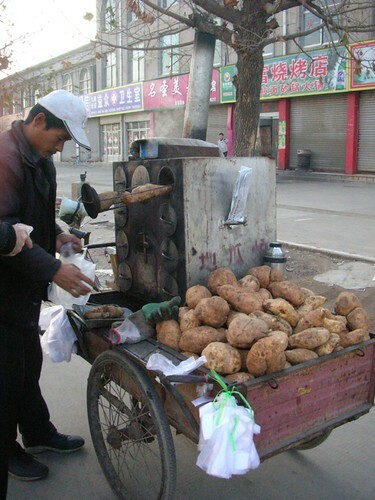 Reminds me of the street vendors I encountered when I was in Shanghai a few months back. I lovee baked sweet potatoes! Wow so interesting! Thanks for sharing. What a great shot and a tasty idea! Hello from a fellow expat. All the best. I use to buy these from guys using a 55 gallon oil drum for roasting. The smell was heavenly. You can do this at home in your oven. It’s easy. It just takes time. The real trick is to leave your sweet potatoes out to dry for a month. Don’t put it in your fridge. And bake it at 300F till done. Remember to put a pan underneath to catch the dripping – it is pure sugar. Oh, the small yellow ones are better than the big red ones. Dryer and sweeter. Wow! Thanks everyone for commenting! Visiting blogspot blogs is sometimes difficult here in China. I’ve tried to leave comments on some of your blogs, others I have not been able to!